I am often asked by people what they should collect and my response is always the same – buy what delights you what you are passionate about. After all most people start to collect as part of a journey of acquiring knowledge and understanding. That said 18th and early 19th century English porcelain still represents great value to the collector. I find that I am often drawn to the pieces where the decoration is inspired by nature. There is a richness and joy in the finesse of painting which would often be unaffordable if it was on canvas. Between 1680 and 1820 the imaginations of some of Britain, Europe and America’s leading philosophers, scientists and writers were inspired by a new age of reason and learning which became known as the Enlightenment. As scientists and collectors sought to catalogue the natural world they influenced society’s awareness and engagement with nature. In response to this naturalistic and botanical styles of decoration on porcelain became prevalent. Chinese taste also inclined fashionable collectors towards the naturalistic Rococo. 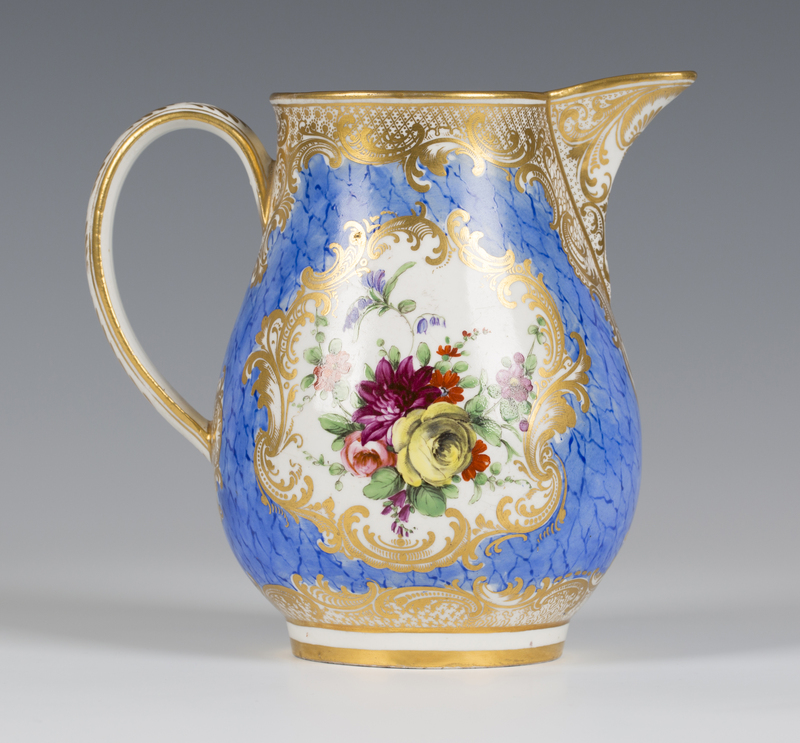 The interesting and unusual Bristol porcelain jug illustrated dates from around 1770. Its pear shaped body is enamelled with flowers on both sides within gilded scroll framing against a veined blue ground. The rim, spout and foot has further gilt scrollwork and trellis detailing. It is exciting to note that the jug has an ‘A. Trapnell’ paper collector’s label to its base. Albert Amor purchased the entire Trapnell Collection of Bristol and Plymouth porcelain in 1912, over 1000 pieces, for an estimated £15,000. It was exhibited and sold at their London gallery. The number ‘353’ to the base of this jug matches the description in Amor’s catalogue, where it is described as ‘an interesting specimen’. This is probably due to the fact that recorded Bristol porcelain with a ground colour, such as this veined blue example, is unusual. The Amor catalogue does not suggest it is not original, although it is known that certain 18th century porcelains, most notably from the Worcester factory, were sometimes redecorated, especially in the 19th century. 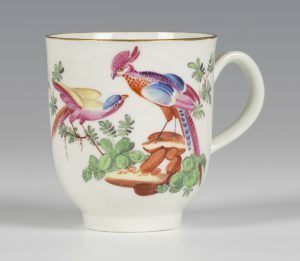 The Worcester porcelain large coffee or chocolate cup dates from around 1765-70, and was probably decorated in the James Giles workshop. James Giles (1718-1780) was an ‘outside decorator’ of porcelain and glass based in London’s fashionable Cockspur Street. Giles decorated pieces of white porcelain which he purchased from porcelain factories including Bow and Worcester. The cup seen here is of typical ‘U’ shape with grooved loop handle gilded with husks. The main body is enamelled in the rococo style showing the influence of the Chinese with a large Fancy Bird on rockwork, accompanied by smaller birds beneath a gilded rim. It is marked with underglaze blue pseudo Meissen mark to base. Today late 18th and early 19th century English porcelain, like the pieces illustrated, can still be purchased at auction for middle hundreds of pounds. Toovey’s next sale of Fine British and Continental Ceramics will be held on Thursday 18th April 2019. Perhaps you too will be inspired by the richness of porcelain inspired by nature.